TiStar 4 Ribbon is a small 2-way-shelf-speaker. It is developed by Thorsten Fischer of Blue Planet Acoustics. TiStar 4 Ribbon is a bass reflex speaker with Tang Band and Omnes Audio drivers: an Omnes Audio ribbon tweeter and a Tang Band fullrange. 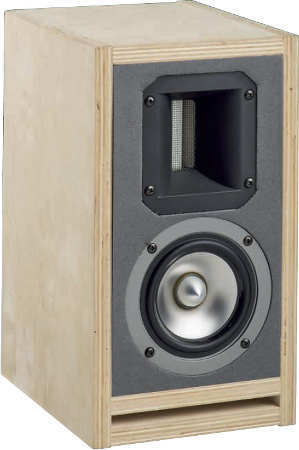 It is a bassreflex loudspeaker. The crossover consists of 3rd order filters (18 dB per octave slope). The frequency response is nearly flat, the harmonic distortion is low at low levels (85 dB / 1m). The decay spectrum shows slight resonances at 500 Hz to 1500 Hz; apart from that it is without any fault. In the kit with high end crossover ClarityCap foil capacitors of type ESA are used in series to the ribbon tweeter. All coils are designed as baked varnish air core coils to suppress vibrations in the coil.